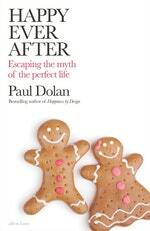 In Happy Ever After Paul Dolan re-evaluates our measures of ‘success’. According to behavioural sciences professor Paul Dolan, happiness isn’t what you’re told; it’s what you do. And in his book Happy Ever After he explores possibilities for reappraising our values so we can take steps towards our own versions of the good life. In doing so, he busts the conventional wisdom that keeps us stuck in various negative ‘narrative traps’, opening doors to positive, more meaningful experiences. Of course, our occupations play a large part in our day-to-day happiness. In the passage below he breaks down the narrative of what constitutes a ‘good job’, and offers an alternate view based not on status or financial reward, but the simple pleasure attained in undertaking the task at hand. This story highlights the very common inner conflict between the social narrative of success, which values status and recognition in a job, and personal experiences of happiness in the job, which will only be affected by occupational status when attention is drawn to it. My friend was experiencing pain and pointlessness at work, but the narrative she told about her job was totally unrelated. A job that makes us miserable is not a good job, but we can convince ourselves it is if it has high status. MediaLand is somewhere my friend had always wanted to work, her parents were proud of her, and her friends were a little bit jealous. So the narrative she created for herself comes from the broader social narrative of status. Happiness by Design wasn’t intended to be ‘The book that will make you quit your job’, as the New Statesman attested. But it was for my friend (eventually) and for readers I have since spoken to. The boss of a law firm I talked to about the book explicitly requested that I did not suggest to any of their employees that they should quit their jobs (a request I had to ignore, of course...). I have never been asked to talk to a group of florists but, if I should be, I am pretty certain that their boss would not request that I refrain from suggesting they seek alternative employment. OK, so lawyers probably have more alternative career options than florists, but it might still seem surprising, seeing that I tell the MediaLand story, that there is more concern about lawyers quitting their jobs than there would be about florists doing so. More recent data also suggest that the most conventionally ‘successful’ occupations are not ones where the happiest workers are to be found. In 2014 the Legatum Institute published a report combining data from the 2013 Annual Survey of Hours and Earnings and ONS data from 2011–13.2 They looked to see which occupational groups were paid the most and which ones had the highest average life satisfaction. Predictably, chief executives and other senior officials were the highest paid, but they were no more satisfied than their secretaries, who were obviously paid much less. Some other professions whose members were happier than their bank accounts might suggest were the clergy, farmers and fitness instructors. There can be a lot of purpose in these roles (and quite a lot of pleasure too, if the fitness instructors I know are anything to go by). There could well be issues with the ‘selection effect’ in that those who choose careers like floristry, on average, might be happier to begin with than those who choose to go into law. Prospective florists, again on average, might also be less affected by the narrative of success than prospective lawyers. We need good longitudinal studies (which follow the same people over time) to find out more. It would also be very interesting to find out if there are differences in the concerns for recognition among people who seek out jobs associated with recognition. We might expect that many of those choosing careers as lawyers care more about what others think of them than those who choose careers analogous to being ‘just a florist’. There are aspects of jobs like floristry, however, which make them more likely to generate happiness than working in a law firm. These include working with nature, regularly seeing the fruits of your labour, generally being around people who want to be with you, and feeling as though you have control over your workload. More than four out of five florists also say that they are able to hone their skills every day, according to the Legatum Institute report. So I reckon that some of the happiness difference between florists and lawyers is caused by the ‘treatment effect’ of occupation. The same can be said for members of the clergy, farmers and fitness instructors. Focusing on the likely daily experiences of the jobs we choose to take can help us avoid the unnecessary pain and pointlessness that often accompany adherence to the narrative of what a ‘good’ job looks like. 1. City and Guilds’ Career Happiness Index (2012). Retrieved from https://www.cityandguilds.com/news/November-2012/careershappiness-index-2012#.Wgoob7acagQ. What if education, success, marriage, kids and health weren't the answers to happiness we're sold? What if you could find your own path?